Tickets for Halloween Horror Nights at Universal Studios Hollywood are now on sale. Depending on the day of the event, you can save from $5 to $25 on General Admission tickets by ordering online: advance prices range from $41 to $66 for general admission; the price at the gate is $66. There is no advance discount price for front-of-the-line passes, which range from $79 to $109, or for Day-Night Combo passes, which range from $99 to $109. 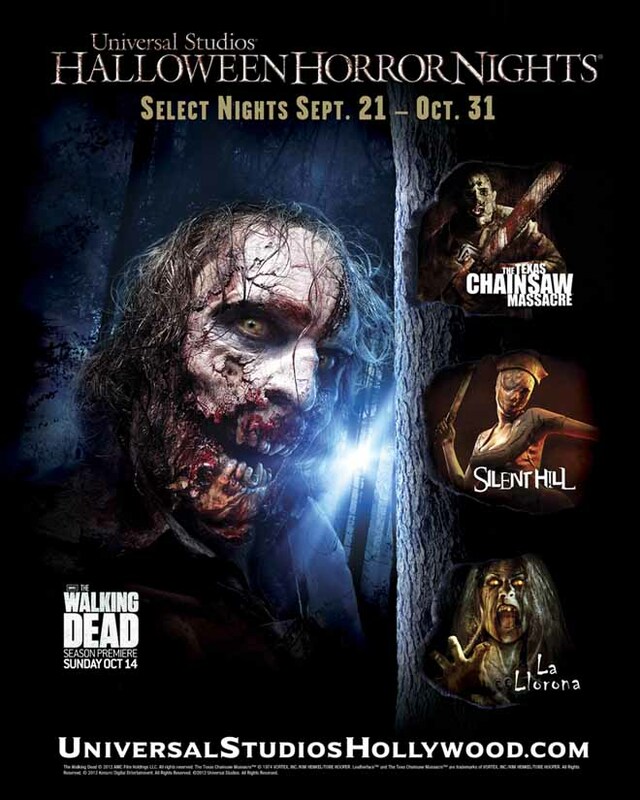 Running on 19 nights from September 21 through October 31, the 2012 edition of Halloween horror nights features mazes based on THE WALKING DEAD, SILENT HILL, THE TEXAS CHAINSAW MASSACRE, and ALICE COOPER GOES TO HELL, among others. Halloween Horror Nights is the most elaborate and technically impressive of any of the Halloween Theme Park Attractions in Los Angeles or the surrounding Southland, so fright fans are recommended to check it out. Universal City, California—Tickets are now on sale for “Halloween Horror Nights®,” Southern California’s premier Halloween event, taking place at Universal Studios HollywoodSM on 19 select nights from September 21 through October 31, 2012. Tickets to this year’s event are available for purchase at www.UniversalStudiosHollywood.com/hhn, including a Front of Line ticket option that enables guests to enjoy priority access at each maze and theme park attraction. Advance purchase is recommended as event nights will sell out. This year’s “Halloween Horror Nights” at Universal Studios Hollywood brings together the sickest minds in horror to immerse guests in the living, breathing, three-dimensional world of the most notorious and terrifying creatures. Featuring a slate of unrivaled film production quality mazes, terror-filled Scare Zones and a new “Terror Tram” experience, uniquely themed to today’s most definitive horror properties, “Halloween Horror Nights” will taunt, terrorize and torment guests with incomparable spellbinding and spine-chilling haunted attractions. Other haunted attractions will include “Welcome to Silent Hill,” based on the popular video games and film franchise; “Alice Cooper Goes to Hell 3D,” a new 3D maze inspired by the legendary shock rocker’s classic concept album; a fully-reimagined experience, “La Llorona: Cazadora de Niños,” based on the terrifying Mexican and Latin American legend that has terrified children for centuries; “The Texas Chainsaw Massacre: The Saw is The Law,” maze based on filmmaker Tobe Hooper’s notoriously unsettling 1974 horror film classic, and the “Universal Monsters Remix,” walk-through attraction featuring Universal’s legendary horror monsters of yesteryear, re-defined for the 21st century along with the pulse-pounding sounds of electronic-fusion music. Details on “Halloween Horror Nights” are available at Halloween Horror Nights, on Facebook at: “Halloween Horror Nights – Hollywood” and on Instagram @HorrorNightsHollywood or #UniversalHHN. Updates from Creative Director John Murdy can be found on Twitter at: Twitter.com/HorrorNights, as he reveals a running chronicle of exclusive information. “Halloween Horror Nights” maze announcement videos can be seen at Universal Studios Hollywood’s YouTube Channel. Halloween Horror Nights is located at Universal Studios Hollywood, 100 Universal City Plaza, Univeral City, CA 91608. The official website is here.